In today’s video, I wanted to talk about how you can learn to play with a metronome. I also want to talk about why you would use a metronome in the first place, how much to use it, and if it makes a difference in your playing at all. Today’s video is actually a request, so I’ll do the best I can with this question and hopefully it helps you guys out. Also, if you have any other video requests, or questions you want answered, feel free to leave it in the comments below. I have a running list of requests, and while I might not necessarily answer them quickly, I always put them on the list, and bring them up when I can. Also just a quick reminder that I pre-recorded this video and am currently on vacation, so I won’t be able to answer your comments immediately. I look forward to reading them when I get back! So are there any benefits to using a metronome? Yeah, absolutely. Pretty much all music is based on time, and the metronome keeps time. Using the metronome can help make sure your rhythm is exact and precise. I want to use a food example because that’s just my way. If you’re making a curry for the first time, maybe you pull out your measuring spoons and carefully get the right amount of spices, following a recipe exactly. And it turns out delicious and you make the recipe, and ones like it, time and time again. So now you don’t need to pull out your measuring spoons – you can just eyeball it. That’s how I feel about metronomes. They’re good at getting your sense of rhythm established, of making sure you’re doing things just so. But once you’ve read lots of music and your understanding of rhythm is excellent and instinctive, the metronome/measuring spoon isn’t needed nearly as often. 1. Once I can play a song through, even if it’s slow, I like throwing on the metronome a couple times just to make sure there aren’t parts I’m speeding up and slowing down (there usually are). 2. I like to use the metronome to help speed up very fast and difficult sections. For some reason, using the metronome helps me incrementally build speed WAY better than just free-forming it would. Say I’m trying to get something from 70 BPM to 90 BPM – I could practice every day and bump up the tempo 1 BPM per day, and after 20 days it would be up to speed. But when I wing it, I’ll stumble more, and sometimes ignore mistakes. The metronome doesn’t let you get away with mistakes. 3. Technique. I really like using the metronome with scales, triads and so on, probably about 50% of the time I play them. To me, one of the purposes of playing scales is to develop evenness and quickness, and the ticking of the metronome keeps me honest. 4. 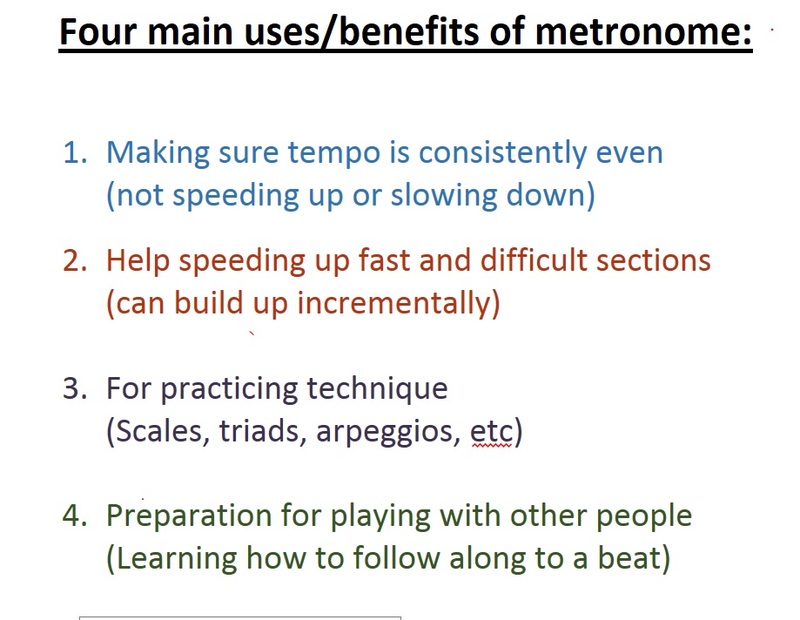 Finally, playing with the metronome can help prepare you for playing with other people. When you get together with a band, say, it’s crucial to be able to follow along to a drum beat. Play with a metronome – or pop songs! In my lessons, we might use the metronome once or twice a month – it really depends on the student and how much they need it. It’s also useful to play along to a recorded track. So say someone’s learning a Taylor Swift song, I would encourage them to play along to the recording of the song. It fills the same role of a metronome (learning to keep time), but with all that exciting pop music. I don’t like to rely on it too heavily, though. Your rhythm shouldn’t fall apart without it. The metronome shouldn’t be the foundation – it should just be a tool used to build that foundation. Okay, so how to actually play with a metronome. First of all, I highly recommend you use a metronome with some sort of visual component. So you can get those old-fashioned metronomes that tick like a clock – those are great – or something like mine, where a light blinks when a beat goes by. I usually find that people who struggle to use a metronome benefit from the visual aid. So even if you’re using an app on your phone, put it up on the piano stand so you can “see” the ticks just as well as you can hear them. After that’s all set up, the best place to start is with scales. A scale you know, and find easy. The thing about scales is that they have a constant, steady rhythm (as opposed to a complicated one), which makes it a good starting point. So I’m going to turn the metronome to 120 BPM, and play a 1-octave C scale in quarter notes. My goal here is to match up each tick of the metronome with one note played. I’m not going too fast or too slow at this point – a nice medium beat is much easier to stick to. Once you’ve got the hang of that, try playing in different rhythms. You could try doing a scale in half note rhythms, and 8th note rhythms. I’ll slow down the metronome to 120 BPM and try my C scale in 8th notes. The goal now is to match up every other note with the beat. So for every two 8th notes I play, one of them is hitting the beat, and one of them is in between the beat. That will help you keep track of each set of 4 notes. Once you’ve mastered scales, it’s time to move on to a simple piece. Depending on what kind of music you usually play, minuets are a good starting point because the rhythm of a minuet is basic. I wouldn’t do anything too jazzy or syncopated at this point. The idea is to start internalizing the evenness of the tick, and wild rhythms can be too distracting. So what I would do is this: pick a line of a simple song, and play it slowly a couple times to make sure you can play it pretty evenly. Then, turn on the metronome beat just a tad slower and try playing along. The song I’m using for this example is a Minuet from way back in the day – I did a tutorial on this one last year that you can find here. But this is a good one because it’s mainly quarter notes, with a few 8th notes and even a triplet thrown in there – but mostly it’s a simple quarter note beat. Take care that you’re matching each note up with a tick. And also make sure that every time you get to a new bar, your metronome is also hitting the start of a new bar (if your metronome is capable of that). Sometimes our notes sound really even and we match it up with the ticking really well, but we’ve somehow deleted a beat, or inserted one – so it’s helpful to make sure you’re starting each new bar in the right spot. Some metronomes (like mine) make a louder tick when you get to the start of a bar, and you can also visually see that with the light. So let’s talk about troubleshooting for a moment. I think the biggest problem people run into with metronomes is not really feeling the beat. I know that sounds abstract, but it’s not. It’s almost like the ticking of the metronome is just another sound, and when they play along to it, that sound falls to the background while they concentrate on their notes. When you can feel the rhythm of the metronome, it isn’t just some ticking that you’re listening to – it starts to become more like a law. And then when you’re playing along to it, you give it proper attention and reverence, because who wants to break the law? So sometimes when people play with a metronome, it’s almost just like a dog barking or child crying. It’s just a sound. A loud, persistent sound, and something that they kind of wish they could avoid. If that’s how you perceive it, then you’ll probably just end up blocking it out and ignoring it while you play. But the tick of the metronome is the law. You can make it faster or slower, but it will always be relentlessly even, no matter how much you bargain with it. Once you start giving it the respect it deserves, and can understand it as the glue that holds your songs together, you’ll be less likely to push the sound to the back of your mind, but instead keep it right at the front and center. So after the minuet example, slowly build up to more complicated rhythms, but really make sure you master the scales and stuff first. When I was brainstorming this video, I actually had a really hard time coming up with good explanations for following the metronome. I like to avoid wishy-washy advice like “just feel the beat”, because that probably won’t help if you don’t feel the beat to begin with. But at the same time, that is what it comes down to. You need to internalize the evenness of music. And there are lots of ways to do that, depending on how you learn – practicing scales with the metronome is a good option, because it’s just you and that ticking sound, and no extra noise. But you can also listen to music as well. Try picking a simple pop song and be the metronome. Tap a steady beat while the song plays, and see if you can keep it even without changing your rhythm even when the other instruments go wild and do more complicated rhythms. See if you can always hear that steady metronome click underneath it all. 1, 2, 3, 4, 1, 2, etc. Then you’ll find that, if you chose the right starting beat, every time you get to beat “1”, it should “feel” like the start of a new cycle. This is actually something I used to do as a kid, for fun. It was kind of like a game to me – I’d wait for a new song on the radio, and then I’d practice counting and see if I could figure out the time signature and play the metronome game. No jokes. If dancing is your thing, that’s another option. You literally cannot dance well if you don’t hear that underlying beat. Anyway, hopefully this gave you a few ideas and things to try when you play with a metronome. Like anything, learning how to play with a metronome is a skill and takes time and practice like anything else. Just remember, the metronome is the law – not an annoying background noise!